244 pages | 57 B/W Illus. This book provides a detailed model of both the discourse and knowledge of physics and offers insights toward developing pedagogy that improves how physics is taught and learned. Building on a rich history of applying a Systemic Functional Linguistics approach to scientific discourse, the book uses an SFL framework, here extended to encompass the more recently developed Systemic Functional Multimodal Discourse Analysis approach, to explore the field’s multimodal nature and offer detailed descriptions of three of its key semiotic resources – language, image, and mathematics. 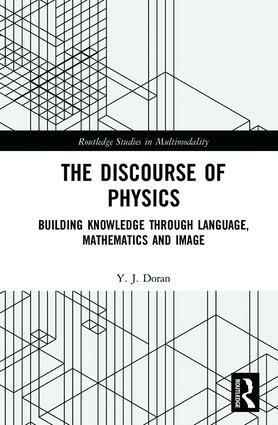 To complement the book’s SFL underpinnings, Doran draws on the sociological framework of Legitimation Code Theory, which offers tools for understanding the principles of how knowledge is developed and valued, to explore the manifestation of knowledge in physics specifically and its relationship with discourse. Through its detailed descriptions of the key semiotic resources and its analysis of the knowledge structure of physics, this book is an invaluable resource for graduate students and researchers in multimodality, discourse analysis, educational linguistics, and science education. Y. J. Doran is a researcher in the LCT Centre for Knowledge-Building and the Department of Linguistics at the University of Sydney, who focuses on Systemic Functional Linguistic theory and description, Legitimation Code Theory and their contribution to the interdisciplinary fields of educational linguistics, multimodality and identity. Edited by Kay O'Halloran, Routledge Studies in Multimodality aims to advance knowledge of multimodal resources such as language, visual images, gesture, action, music, sound, 3-D artefacts, architecture and space, as well as the ways these resources integrate to create meaning in multimodal objects and events.